Scrooge and the Ghost passed on, invisible, straight to Scrooge's clerk's; and on the threshold of the door the Spirit smiled, and stopped to bless Bob Cratchit's dwelling with the sprinklings of his torch. Think of that! Bob had but fifteen "Bob" a week himself; he pocketed on Saturdays but fifteen copies of his Christian name; and yet the Ghost of Christmas Present blessed his four-roomed house! Then up rose Mrs. Cratchit, Cratchit's wife, dressed out but poorly in a twice-turned gown, brave in ribbons, which are cheap and make a goodly show for sixpence; and she laid the cloth, assisted by Belinda Cratchit, second of her daughters, also brave in ribbons; while Master Peter Cratchit plunged a fork into the saucepan of potatoes, and, getting the corners of his monstrous shirt collar (Bob's private property, conferred upon his son and heir in honor of the day) into his mouth, rejoiced to find himself so gallantly attired, and yearned to show his linen in the fashionable Park And now two smaller Cratchits, boy and girl came tearing in, screaming that outside the baker's they had smelt the goose, and known it for their own; and, basking in luxurious thoughts of sage and onion, these young Cratchits danced about the table, and exalted Master Peter Cratchit to the skies, while he (not proud, although his collars nearly choked him) blew the fire, until the slow potatoes, bubbling up, knocked loudly at the saucepan lid to be let out and peeled. "What has ever got your precious father then?" said Mrs. Cratchit. "And your brother Tiny Tim! And Martha warn't as late last Christmas day by half an hour!" "Why, bless your heart alive, my dear, how late you are!" said Mrs. Cratchit, kissing her a dozen times, an taking off her shawl and bonnet for her. So Martha hid herself, and in came little Bob, the father, with at least three feet of comforter, exclusive of the fringe, hanging down before him; and his threadbare clothes darned up and brushed, to look seasonable; and Tiny Tim upon his shoulder. Alas for Tiny Tim, he bore a little crutch, and had his limbs supported by an iron frame! "Not coming!" 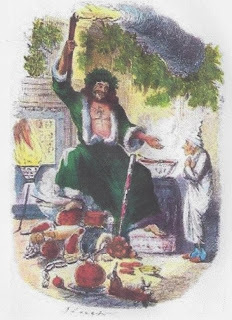 said Bob, with a sudden declension in his high spirits; for he had been Tim's blood-horse all the way from church, and had come home rampant, -- "not coming upon Christmas day!" Martha didn't like to see him disappointed, if it were only in joke; so she came out prematurely from behind the closet door, and ran into his arms, while the two young Cratchits hustled Tiny Tim, and bore him off to the wash-house that he might hear the pudding singing in the copper. "As good as gold," said Bob, "and better. Somehow he gets thoughtful, sitting by himself so much, and thinks the strangest things you ever heard. He told me, coming home, that he hoped the people saw him in the church, because he was a cripple, and it might be pleasant to them to remember, upon Christmas day, who made lame beggars walk and blind men see." Bob's voice was tremulous when he told them this, and trembled more when he said that Tiny Tim was growing strong and hearty. His active little crutch was heard upon the floor, and back came Tiny Tim before another word was spoken, escorted by his brother and sister to his stool beside the fire; and while Bob, turning up his cuffs, -- as if, poor fellow, they were capable of being made more shabby, -- compounded some hot mixture in a jug with gin and lemons, and stirred it round and round and put it on the hob to simmer, Master Peter and the two ubiquitous young Cratchits went to fetch the goose, with which they soon returned in high procession. Mrs. Cratchit made the gravy (ready beforehand in a little saucepan) hissing hot; Master Peter mashed the potatoes with incredible vigor; Miss Belinda sweetened up the applesauce; Martha dusted the hot plates; Bob took Tiny Tim beside him in a tiny corner at the table; the two young Cratchits set chairs for everybody, not forgetting themselves, and mounting guard upon their posts, crammed spoons into their mouths, lest they should shriek for goose before their turn came to be helped. At last the dishes were set on, and grace was said. It was succeeded by a breathless pause, as Mrs. Cratchit, looking slowly all along the carving knife, prepared to plunge it in the breast; but when she did, and when the long-expected gush of stuffing issued forth, one murmur of delight arose all round the board, and even Tiny Tim, excited by the two young Cratchits, beat on the table with the handle of his knife, and feebly cried, Hurrah! There never was such a goose. Bob said he didn't believe there ever was such a goose cooked. Its tenderness and flavor, size and cheapness, were the themes of universal admiration. Eked out by applesauce and mashed potatoes, it was a sufficient dinner for the whole family; indeed, as Mrs. Cratchit said with great delight (surveying one small atom of a bone upon the dish), they hadn't ate it all at last! Yet every one had had enough, and the youngest Cratchits in particular were steeped in sage and onion to the eyebrows! But now, the plates being changed by Miss Belinda, Mrs. Cratchit left the room alone, -- too nervous to bear witnesses, -- to take the pudding up, and bring it in. Suppose it should not be done enough! Suppose it should break in turning out! Suppose somebody should have got over the wall of the back yard, and stolen it, while they were merry with the goose, -- a supposition at which the two young Cratchits became livid! All sorts of horrors were supposed. Hallo! A great deal of steam! The pudding was out of the copper. A smell like a washing-day! That was the cloth. A smell like an eating-house and a pastry-cook's next door to each other with a laundress's next door to that! That was the pudding! In half a minute Mrs. Cratchit entered, -- flushed but smiling proudly, -- with the pudding, like a speckled cannonball, so hard and firm, blazing in half of half a quartern of ignited brandy, and bedight with Christmas holly stuck into the top. O, a wonderful pudding I Bob Cratchit said, and calmly too, that he regarded it as the greatest success achieved by Mrs. Cratchit since their marriage. Mrs.Cratchit said that now the weight was off her mind, she would confess she had had her doubts about the quantity of flour. Everybody had something to say about it, but nobody said or thought it was at all a small pudding for a large family. Any Cratchit would have blushed to hint at such a thing. At last the dinner was all done, the cloth was cleared, the hearth swept, and the fire made up. The compound in the jug being tasted, and considered perfect, apples and oranges were put upon the table, and a shovelful of chestnuts on the fire. Then all the Cratchit family drew round the hearth, in what Bob Cratchit called a circle, and at Bob Cratchit's elbow stood the family display of glass, -- two tumblers, and a custard cup without a handle. "A Merry Christmas to us all, my dears. God bless us!" Which all the family re-echoed. "God bless us every one!" said Tiny Tim, the last of all. He sat very close to his father's side, upon his little stool. Bob held his withered little hand in his, as if he loved the child, and wished to keep him by his side, and dreaded that he might be taken from him. Scrooge raised his head speedily, on hearing his own name. "Mr. Scrooge," said Bob; "I'll give you Mr. Scrooge, the Founder of the Feast!" "The Founder of the Feast indeed!" cried Mrs. Cratchit, reddening. "I wish I had him here I'd give him a piece of my mind to feast upon and I hope he'd have a good appetite for it." "My dear," said Bob, "the children! Christmas day." "It should be Christmas day, I am sure," said she, "on which one drinks the health of such a odious, stingy, hard, unfeeling man as Mr. Scrooge. You know he is, Robert! Nobody knows it better than you do, poor fellow!" The children drank the toast after her. It was the first of their proceedings which had no heartiness in it. Tiny Tim drank it last of all, but he didn't care two pence for it. Scrooge was the ogre of the family. The mention of his name cast a dark shadow on the party, which was not dispelled for full five minutes.